This is a large community, and like all large communities it can have its personality conflicts. If another member, or that person's signature, rubs you the wrong way, a simple solution is to set your preferences to ignore that person, provided the person is not a member of the eG Staff. (Ignoring an eG staff member is a violation of the Member Agreement.) You can ignore any combination of a member's posts, messages or signature. Note that the 'ignore' setting will only work when you are logged onto the site as yourself; guests always see members' posts and signatures in the forums open to guests. Select "Ignored Users" to go to the menu, where you will see a list of currently-ignored members as well as the option to ignore members. 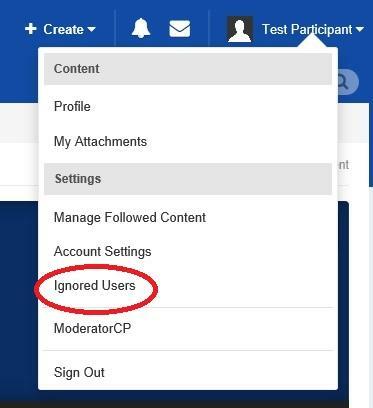 When you start typing a user's name in the "Add new user to ignore list", a drop-down menu will provide a list to help select the correct name. To change your settings for an ignored user, select the 'settings' wheel next to the user's avatar. That will allow you to un-ignore the user entirely, or to change the elements that you ignore. Note that a user will never be notified that you are ignoring him or her.